Between November 2004 and July 2005 Ladan suffered three brain haemorrages, a severe siezure, some dangerous infections and other complications that required over a dozen invasive brain surgery operations. Ladan has been in a state of reduced consciousness since a haemorrhage in November 2004 with further set-backs in December of that year and March and July in 2005. Since then, at the time of writing, Ladan has remained increasingly stable. There have been no major improvements in the last year but some very small possitive signs are often observed. 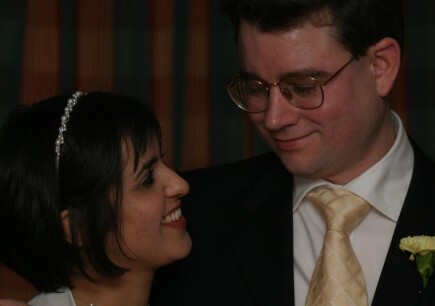 Shortly after our wedding in April 2004, Ladan started to have very vivid and frightening visions that something terrible was going to happen to one of us, probably herself, these visions started to trouble Ladan quite a bit. Ladan also had a couple of bad asthma attacks and then some sharp pains, short-lived and generally in her legs. Ladan tried, as much as possible, to put these things to the back of her mind and take no notice of them, she spoke to her GP and they saw no cause for concern. While teaching children at the Reading Baha’i summer school in August 2004 Ladan developed some redness, swelling and blisters on her right foot. It seemed that a bee or similar insect had bitten or stung her right ankle, though even then it looked like something of an over-reation. Rather than settle down, the swelling spread to her left foot. It was uncomfortable for driving and walking and the doctors, unsure what the cause could be, prescribed a cream which I spent many weeks massaging her feet with, it seemed to calm the pain and swelling but did not cure the problem very quickly. Eventually a course of steroids fixed the problem. No sooner had the swelling died down than Ladan’s wrists swelled up in the same manner and Ladan also got occasional tingling and numbness in her fingers. Again, the doctors could not explain it but steroids cured it. In early October Ladan developed a severe pain in her stomach which kept her in bed most of the time and caused her to vomit almost everything she ate. For the first time in her life Ladan had to take time off work. During the October school half-term holidays we came up to Newcastle thinking a nice break visiting relatives may help, unfortunately it didn’t after a few more days of no improvement and more visits to GPs in the area she was admitted to hospital where she was kept under watch. At that time they still suspected a simple stomach disorder such as gastroenteritis or possibly a stomach ulcer.One week later, on the morning of 4th November, she had sudden severe head pain accompanied by numbness in her face and arms, slurred speech and blurred vision. Doctors assured us that this was a very bad migraine headache until the afternoon when they started becoming concerned it may be something more and set up an MRI scan for her. Ladan spent an hour in the MRI room with more doctors and big books entering the room as we waited, finally she came out and smiled very sweetly as I shared a joke with her and she told me the headphones hadn’t been working in the scan room, then, before the consultants eyes, she fell unconcsious. Having seen the scans they were already aware that this could be a severe bleed in Ladan’s head and they treated it as such, Ladan was to have urgent brain surgery to remove the blood clot, which, I was warned, she may not survive. The family sat together in Ladan’s former cubicle praying and text messages flew out asking others for prayers too. Following surgery we were informed that she was still alive but only just and the best case scenario was that she would live with severe brain damage for the rest of her life. Ladan was moved to the Intensive Care Unit. From that time to now Ladan has been unconscious. The bleed, we were informed, had been caused by a rare vascular disease called Churg-Strauss Syndrome. The main test for this is a blood test which takes about a week to complete and the results had arrived while Ladan was in the MRI scan. The blood clot had been focussed around the base of the brain and had caused severe damage to the brain stem and the many nerves in that area, this would affect control of breathing, heart rate, blood pressure, and movement. The higher cotrical regions of the brain, believed responsible for thought and understanding, were relatively untouched by comparison. In the early weeks Ladan seemed to be doing very well, though she was fairly unstable and caught many infections, she was quickly breathing for herself and started understanding and responding to requests, Ladan started looking around and focussing on people and scanning text. Toward Christmas her responsiveness seemed to drop for long periods of time – whereas previously she had squeezed hands on request she would only stick out her tongue or request, or merely shake her head when she was asked if she could do something – she would then be very alert for shorter, less frequent periods. A few days before Christmas her mother and grandmother were communicating with her, getting yes and no answers from the nodding and shaking of her head, and having smiles in response to promises of the meals that would be cooked for her when she was out of hospital. On Christmas Eve Ladan’s temperature, blood pressure and heart rate started to rise sharply, something that had often happened and was being treated with a particular drug. That night, as much as Ladan’s Mum pleaded while Ladan became more and more unstable, the usual drug was not given. In the early hours of Christmas Day Ladan started having violent seizures (fits), these remained violent for about two and a half hours and continued at a lower level until midnight (nearly 24 hours). Scans were unable to find a cause for the seizure, the likes of which had not been seen in the weeks prior to, or the months following, that night, beyond the conditions that she was left to endure. Scans do, unfortunately, show that the seizure had caused extensive extra damage to Ladan’s brain, now the outer ridges of the brain were damaged, impacting on the cortical regions, and barely any activity was detectable. The scan that nigiht also revealed a small rebleed in the cerebellum, probably a couple of weeks old, which may possibly account for the change in responsiveness observed from around that time. It took Ladan a couple of weeks before she started opening her eyes again and responding to light and pain, but she did it, and since then it has remained a slightly bumpy ride for Ladan, she has had one or two very stable periods and during them she has done some encouraging things such as manage to move her head or limbs this way then that in response to requests several times running or give very definate blink responses on request, but even when Ladan is at her best she does these things very infrequently, doctors and nurses have not therefore witnessed these signs and scans continue to suggest there is barely any activity in the cortical areas of her brain. Ladan has undergone a lot of brain surgery since Christmas, mainly in an attempt to deal with a condition called hydrocephalus, a build up of excess fluid in the brain which can cause dangerous pressure levels and reduce consciousness. This is very common in patients who have had a brain haemorage and has a simple treatment but complications are common and in Ladan’s case complications became a standard occurence, having had more than 11 operations since Christmas, often 2 in less than a week. Hydrocephalus itself, surgery for it and infections have often been keeping Ladan back from basic health in her attempt to recover. The underlying condition of Churg-Struss Syndrome however, which caused the original problems, does seem to be firmly under control. At the end of July Ladan had her last treatment for the apparant hydrocephalus, though it is still very apparant on scans. A few days after that Ladan suffered a deterioration in her wakefulness and in her eye control as well as an increase in facial twitching, particularly in and around her eyes. An MRI scan taken at the end of August showed that Ladan had suffered a further small haemorrhage, this time in her brain stem. Discussions over funding issues between the Primary Care Trust and the different parties involved caused major delays in getting Ladan into a rehabilitation centre. On 31st August Ladan moved to a rehabilitation centre in Peterlee, Co. Durham, but they didn’t have much to offer by way of a rehabilitation programme. At the beginning of May this year we moved back to Newcastle into a care home called The Minories, where we remain to this moment, again there is little rehab input but the environment is quieter and friendlier. Although occasionally doctors have expressed cautious optimism when Ladan has been well and showing encouraging signs, and although she does show some signs of basic awareness, the prognosis remains almost as poor as it did on November 4th, that Ladan is unlikely to make much progress from her current state. There are occasionally very encouraging signs of awareness that give hope that Ladan may among that small number of people who do make amazing recoveries from these kinds of scenarios, virtually all of whom do so with great devotion from a loved one. I also have a great faith in prayers, which I say regularly, and there are a wide array of small but encouraging details that collectively raise hope very well.. for one small example among many: in addition to having clear visions of a disaster in the wings Ladan also had an extremely clear and vivid vision of giving birth to a son. People all around the world have been praying for Ladan, people from all backgrounds and religions, and I truly appreciate this with all my heart.